Now you will learn about caves. Actually caverns. A cave is different than a cavern. I bet you didn’t know that. Humans have determined the distinction between caves and caverns based on human relativity. What I mean is, to name the thing either a cave or a cavern, we have to describe how we as humans can penetrate it. Don’t believe me? 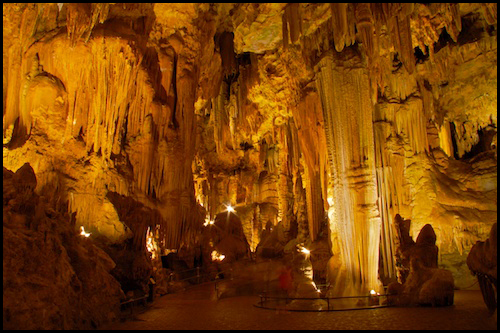 Check out the difference between caves and caverns in your preferred search engine. Caves are “…natural underground space[s] large enough for a human to enter.” They are entries for humans. Human entry. Point made. Caverns are places where no natural entry by humans, nor sunlight, can occur. See: plugging the hole. We visited Luray Caverns. They used to be called the Luray Caves, before a few opportunistic men penetrated their dark limestone folds and determined that there was some value in allowing other men (and women) to penetrate them, too. So they sealed off the entry way with a lavish building that charges you $22 to enter it. Now it’s called the Luray Caverns. And nothing from the natural world can get in, unless it wants to go through the back door. We arrived at Luray Caverns for exactly the purpose of penetrating it. And we enjoyed every mysterious second. The caverns made no comment when questioned about whether or not this feeling was reciprocal; however, sources say it hasn’t complained since its discovery in 1878. Why would it start now? Now, here’s some other things I’ll bet you didn’t know about caverns. Stalagmites are the ones growing up from below. Think ‘G’ for ground. What makes Luray Caverns so cool is that they have the only Stalacpipe organ. In 1954, a guy named Sprinkle noticed that when his son hit his head on a roof rod (stalactite), it emitted a musical tone. Sprinkle decided to create a complete scale with various stalactites; the sound carried by stereo magnetic forces (yeah, I made that up). It impressed all the locals so much that people dressed up in suits and gowns and had balls down there. Seriously. We had the sheer luck of listening to this roof rod musical, and it was pretty… pretty impressive. Anyways, I like caves. People have weddings down there, and if I was to renew my vows, I just might do it in a cave. With Batman. Hah, just kidding. I’d still marry Travis. But I’d make him wear a suit. The one that Batman wears. There’s a joke somewhere in there about cavern penetration, but I’ll sidestep that one. I’m a decent person. Rach attempts to 'fix' the RV. With pathetic results.